Profiles of temperature, oxygen, and electrical conductivity were obtained for 3 sites in Sandy Lake on Oct 3, 2017, as shown below. The depths for sites 1, 2 and 3 were 17.5, 10 and 5.5 m.
Profiles at Sites 1 and 2 were similar with a distinct surface layer in the top 7 m, and then continuous declines in temperature and oxygen, and increases in conductivity to the bottom. It’s likely that in the summer when surface water temperature want up to 25 degrees C or higher, there were distinct surface and deep layers (epilimnion and hypolimnion) with a thermal gradient between them (the metalimnion), and that on Oct 3, that 2 -layer systems was in the process of breaking down. 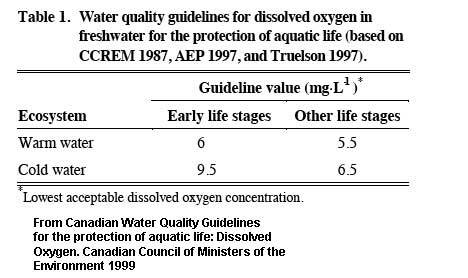 (ii) for the deepest profile (Site 1), the oxygen content of the deeper layers is below guidelines for both warm water and cold water aquatic life. 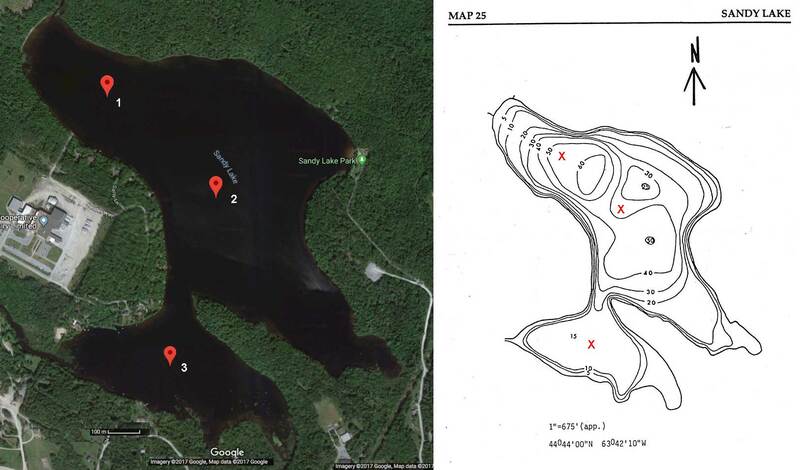 Location of three sites at which limnological profiles were obtained on Sandy Lake; bathymetric map at right . (Bathymetric map from P. Mandell, 1994. The effects of land use changes on water quality of urban lakes in the Halifax/Dartmouth region. MSc thesis, Dalhousie University.